Dr Petar Dragić pioneered laser vein surgery eight years ago in Serbia and is one of the world’s leading experts in the discipline today, having won numerous awards for his contribution to this branch of medicine. In creating the clinic, Studio Fluid – an architecture practice based in Belgrade – wanted to come up with a concept that reflected the cutting-edge treatments offered by the clinic while putting patients at their ease. All materials used in the interior – Corian®, MDF, epoxy floors and every piece of furniture and equipment – are in varying shades of white, which creates subtle contrasts in colour and texture. Studio Fluid specified Corian® because of its durability, formability, translucency and its overall combination of functional and sensorial qualities. Two colours of Corian® have been used: Glacier White for unlit areas and translucent Glacier Ice colour for illuminated areas. The Dr Dragić Center for Contemporary Laser Vein Therapy in Novi Sad, Serbia. Corian® high-tech surface in the translucent Glacier Ice colour has been used for the backlit wall cladding panels; the Glacier White colour of Corian® was used for the door cladding. Project by Studio Fluid; photo Ana Kostić, courtesy of Studio Fluid, all rights reserved. 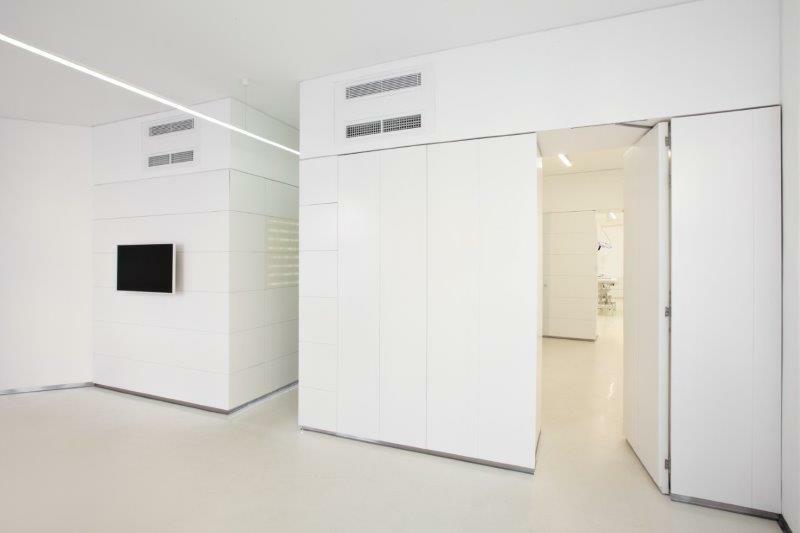 Corian® is used to line sections of a 15m long corridor linking the reception area to the waiting room, to create an illuminated counter in the reception area, and for storage units in the clinic’s treatment rooms. As patients enter the clinic, they find themselves in a small reception room featuring a glowing counter made from Corian®, in the translucent Glacier Ice tone, combined with MDF. From there, they enter the long corridor where panels of translucent Corian®, lining the middle section of the corridor walls, have been carved to form a pattern which is backlit by LED lighting. In contrast, the corridor’s hidden doors – made of Corian® in Glacier White colour and carved with a relief pattern – are not illuminated. As a result, when all lights are turned off, the panels look uniform, but when they are turned on, a completely different picture appears. The Dr Dragić Center for Contemporary Laser Vein Therapy in Novi Sad, Serbia. Corian® in the Glacier White colour has been used for the wall cladding of door panels.Project by Studio Fluid; photo Ana Kostić, courtesy of Studio Fluid, all rights reserved. Above the corridor, a long, thin LED lamp is attached to the ceiling by barely visible cables, giving the impression of a laser beam passing through the entire space and emphasising the path patients follow. Adding to the understated, mysterious feel of the overall design, treatment rooms are located behind the hidden doors along the corridor. 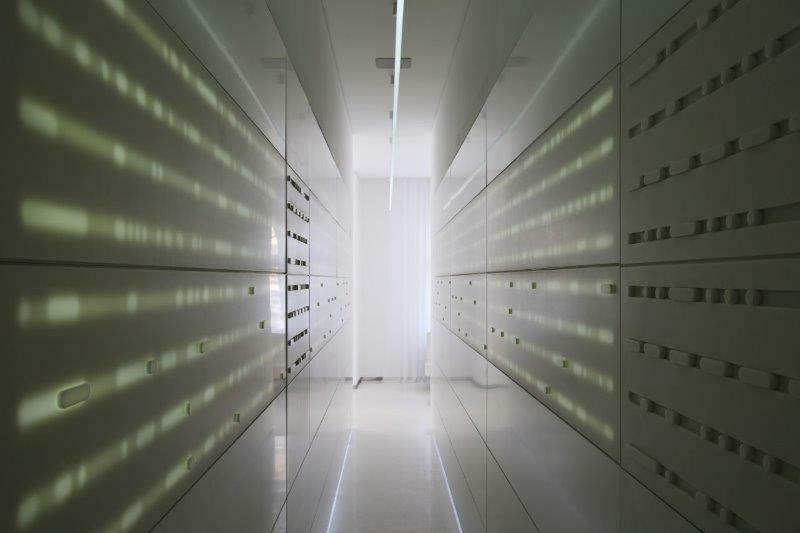 Inside these rooms, the cabinets and cupboards are also made from a combination of Corian® and MDF panels, and emit a glowing colour from the lights hidden within. Architect Zorana Vasic of Studio Fluid comments, “We had used Corian® for other projects – for example a beach lounge in Dukley where we designed a long bar with an illuminated, glowing top. When we started to work on the concept for the Dr Dragić clinic, we knew we wanted to create light effects on the wall, so it was natural to use Corian® again.